I have come to believe that pie making is not as daunting as it is sometimes made out to be. 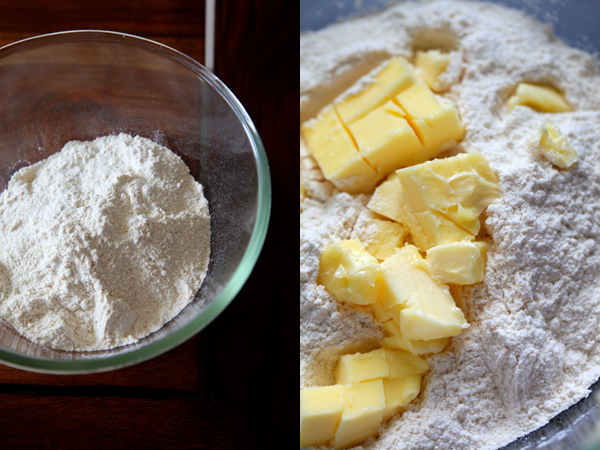 As far as you follow a few simple rules of pastry making basics, you are good to go! The most important being weighing the ingredients right, keeping the ingredients cool, using a cold surface for rolling the dough and handling the dough as little as possible. If you follow these simple rules, you are most likely to get a tender and flaky, buttery crust that will stand you in good stead. And once you have that crust to die for, you could do so many things by letting your imagination and creativity free. Fill it with a savoury or sweet filling and sprinkle it with nuts, fresh fruits or dry fruits. Making a tart or a pie and seeing the raw ingredients transformed into an edible and good looking entity puts me in a happy state of mind and gives me a deep sense of contentment. The atmosphere at home also takes on a cheery note with me in this frame of mind and there is happiness and laughter all around, all thanks to the baking. This year is no different from others when a post with mangoes in it makes an appearance at the end of the mango season instead of the beginning! As usual, I have to unabashedly admit that I was too busy relishing this divine fruit and did not bother to cook with them. Obviously, I couldnt let an entire season pass without a post on mangoes, so here they are in all their glory adorning the tops of my delicious custard tarts, taking them up a notch with their ambrosial qualities. If you love custard like me and also love a good flaky and buttery crust, then this is a match made in heaven! 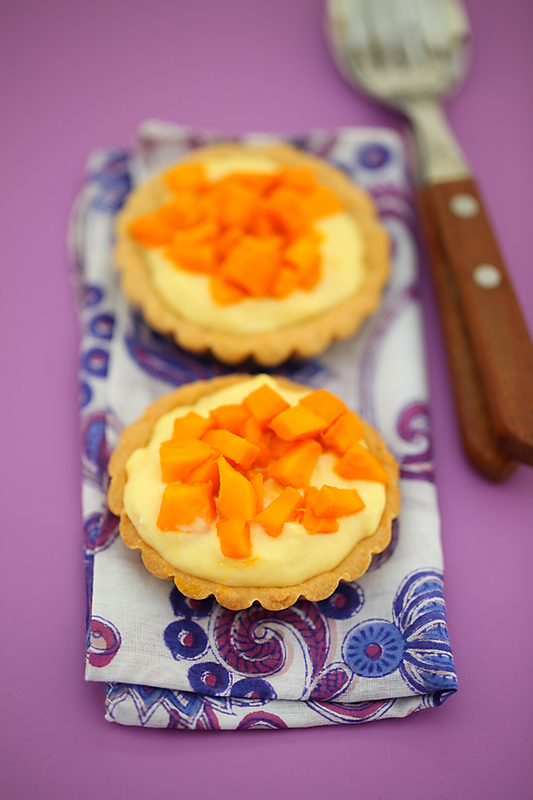 These beautiful tarts have a tender crust and the custard which is creamy and smooth, perfectly complements it. And what more should I say about the mangoes as the topping or the crown of this dessert? It’s best that you make it and experience the goodness yourself. As the mango season comes to an end, I’m filled with gratitude for having been able to enjoy the seasons best mangoes and eating them to the core every day! And also for the ability of having made these tarts and sharing them with family and friends and with all of you in this space. I have topped these tarts with mangoes, but you could use any other favourite seasonal fruits like berries, kiwi or pomegranate. Roll out the dough to about 3 mm (1/8”) thickness and using a round cookie cutter which is a little bigger than your tart mold, cut out rounds and line the tins or molds. (If you don’t have a tart mold, don’t fret…simply cut rounds and lightly press them into muffin or cup cake tins.) Do not over stretch the dough and turning it over and over again while rolling. Prick with a fork all over and bake in a pre heated oven at about 180 C/350 F for about 25 minutes*. *You can use 100% plain flour for a very tender and flaky crust or 50% plain flour and 50% whole wheat flour for a grainer and healthier version. *The baking time can be 5 minutes more or less depending on your oven. In a saucepan, mix in the milk and the cream. In a small bowl, put in the custard powder. 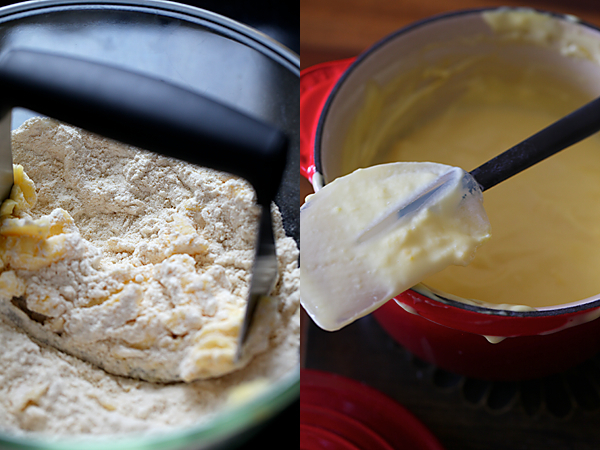 Take about 1/4 cup milk from the saucepan and mix it with the custard powder to make a smooth paste. Mix in the sugar with the milk in the saucepan and bring it to a boil over medium heat. Lower the heat and put in the custard paste, stirring all the while and bring to a boil. This will take less than a minute. Turn off the heat and allow to cool. Spoon a little cooled custard over a completely cooled tart. Garnish with a few pieces of finely chopped mangoes. Makes 12 small tarts or tartlets and one 9” pie. Make ahead: You can freeze the dough for upto a month. Bring it down to the refrigerator and leave overnight or for half an hour or more on the counter before you roll the dough. You can also freeze the fully baked tarts in an air tight container for a month. For a fresher version, you can also roll out the dough and press into tart forms and freeze them. Bring them out and thaw for 15 to 20 minutes and then bake. Freezing the dough and then baking the tarts gives fresher tarts than freezing the baked tarts in an air tight container. Yummy it looks and I am sure it tastes divine! Anything with mango is good. Thanks for sharing the recipe. Hi Anu seems to be a very good recipe. Can I make the tarts in advance and use it later. If so how many days in advance can I make them. hi anu, I enjoy reading your blog and I must say you are a great and passionate cook. Your posts are very inspiring and there is lots to learn from you. Keep going and thanks for this eggless version. by the way, where does one get tart moulds? Shtuti: Yes you can make this ahead. You can freeze the dough for upto a month or the fully baked tarts in an air tight container for a month. You can also roll out the dough and press into tart forms and freeze them. Bring them out and thaw for 15 to 20 minutes and then bake. S: I had to make something with mangoes and this was the best I could think of! aparna: Thank you for your kind words. You can get tart molds in Arife in Mumbai or some departmental stores like homestop if you are lucky. 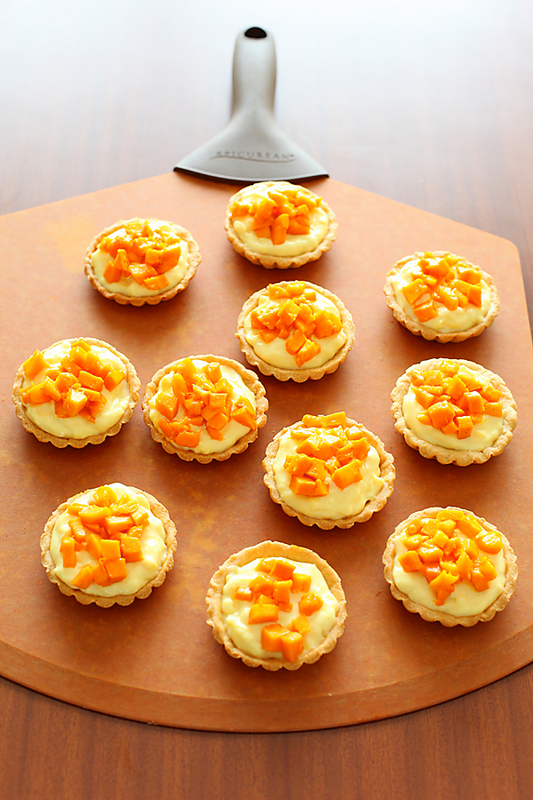 The tarts look sunny and bright:) Can I incorporate mango puree into the custard? Do you think it would work well? How much of the puree and how can i add? Those look so delicious and fresh! It makes me want to run to my kitchen and make them straight away :-). Latha: Ofcourse you can. 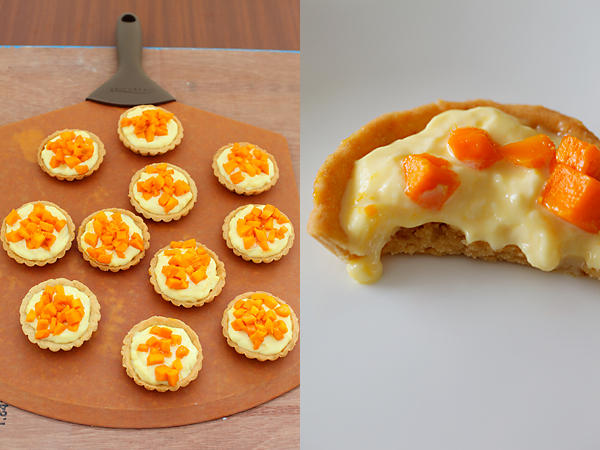 Mix in 1/4 cup to 1/3 cup mango puree into the custard powder and milk paste and proceed as given above. Marian: Hope you love making these as much as I did! I love mangoes and am envious of those that are available in India. I have to look long and hard for mangoes here. Really loving your little mango pies here! Wow…lovely recipe…tarts look so perfect and cute….that custard filling is really tempting…..
sassubai: One of the basic rules of pastry which I like to follow is to use cold butter. This has never failed me. Also, if you don't prick the tarts then sometimes they puff up. Infact, many bakers choose to line their tarts with greaseproof paper with beans to prevent them from puffing but I simply like to prick with a fork when I'm baking with tartlets. I totally agree that Tarts with whipped cream and fruits are a treat! 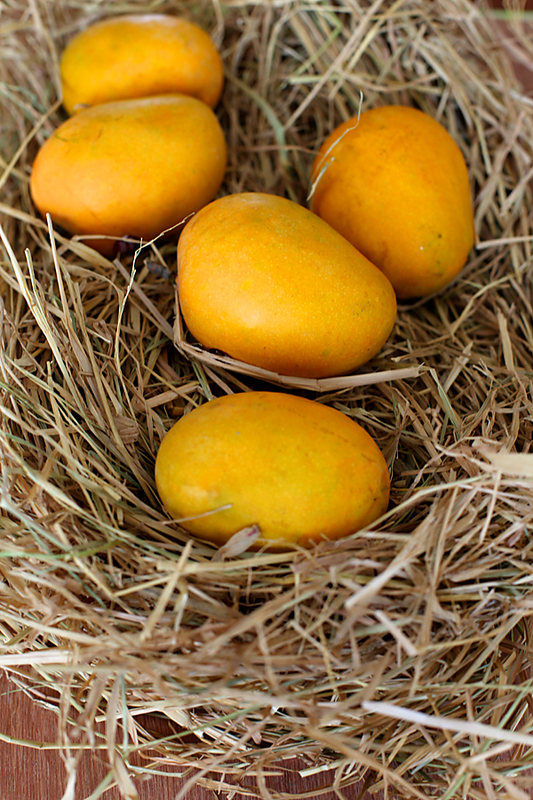 Meeta: You get the best mangoes here in Mumbai..I wish I could send some across to you! Please tell which butter has to be used. From photographs it seems to be the normal salted butter. Am I right? Shruti: Yes…normal salted butter…I used Amul! please help me with some information. You have a self hosted blog on wordpress right? Can you please tell me who designed your blog? I'm working on a blog and I have no clue how to proceed. How do you update the posts everytime? I have signed up with hostgator and have an account. but do you have to upload files to the webdisk everytime? sorry to spam your post, but please help!! cud u kindly confirm if the tarts are to be assembled after the custard is brought to room temperature and refrigerated together? Saumya: Don't worry! 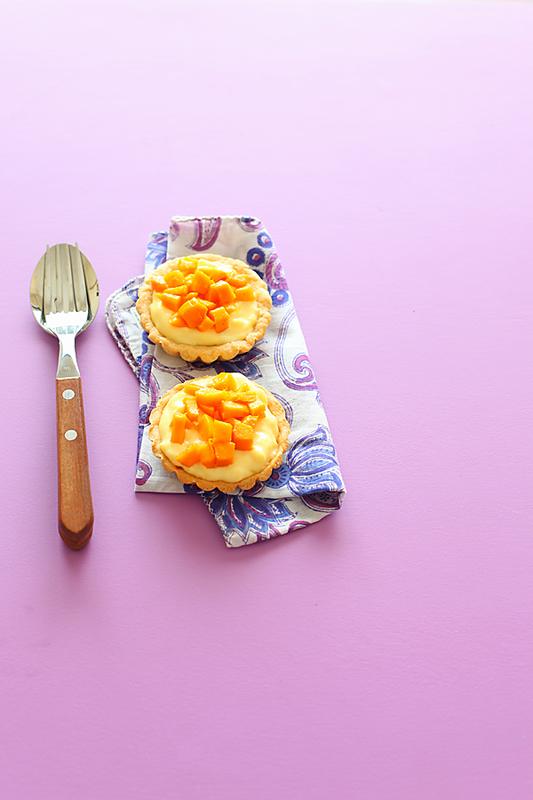 you can make these tarts even without mangoes with other seasonal fruits. Yes, the tarts need to be assembled after the custard is brought to room temperature. You only need to place the dough in the refrigerator before rolling it out. ….Also can you please let me know if it is butter is saled or unsalted cokking butter. What do u mean by cream? What kind of cream do i meed to use? A few quick queries, do we need to grease the tart moulds? Also, while I will keep the mould in the centre rack of the oven, should I place them on the baking grill or on the baking tray? saumya: Sorry for the delayed response. Hope you had good results with this. 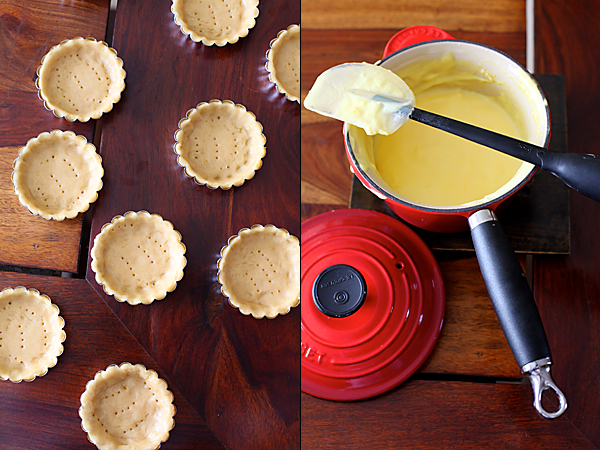 You don't have to grease the tart moulds if you are using non stick ones. Lightly grease otherwise as a precaution as even if you dont the fat content in the tart will not make it stick to the moulds.You could use either a grill or a tray but a tray would be better. looks yummy. i'm going to try this soon. i have a query.can i make this in a muffin mould? Hi ,I wanted to ask if we can use muffin moulds for these. Niyati: Thank you for the compliments. I think you can try using a muffin mould..dont fill it up though. This will give you a different shape but would be no less delicious. hi anu wht if i use only plain flour insted of whole wheatflour it wil work? sudhir: Yes it would! I used a little whole wheat flour to make it healthier. Very tasty …delicious….I just have query that my custrad is very liquidi how do I make it thick becoz after adding whipped cream .can you please let me know the measurements of custard powder . Tarika: The custard needs to be thick here. Add the amount mentioned in the recipe and you will get the right consistency. Let me know if you need anything else. Thank you so much for your prompt reply. I tried making it twice consistency was right but the custard was tasting as if custard is not blended properly it wasn't tasting good,like (kaacha custard ) I had put 500ml of milk 3 tblspn . tarika: Looks like you havent cooked your custard properly..carefully read the instructions on the packaging. That will help as well. Good luck! hi can i use 100% wheat flour? jay- You can try! If you do, let me know how it works! Wow it is looking yummy.In summers everyone prefer to have mangoes over other fruits.I will definitely make it. Ravish- Hope you like it! i tried tart yesterday it came out superb i used to think tart making is tough but its very easy you explained very nicely my tart r just perfect in my first try thank you so much.. i tried many cake recipes from ur blog too all r bang on.. .
sweta- Thank you for the feedback. Happy to know that your baked goodies turned out well! Want to make this tart with ganache filling.. my question is can store this for 4 to 5 hours fully ready tarts? If yes then how? Naziya- Yes, you can store it in the refrigerator. Your tarts looks really nice. One query can i make the custard in advance like say 2-3 days before and store it in the fridge? Since the custard is made with milk, I would suggest you make it fresh.